Ethnic minorities in Yunnan account for about 34 percent of its total population. Major ethnic groups include Yi, Bai, Hani, Zhuang, Dai and Miao. Yunnan, province in southern China, bordering the countries of Myanmar, Laos, and Vietnam. Most of the inhabitants of Yunnan live on a relatively low plateau in the east, which includes Kunming the capital, largest city, and principal industrial center of Yunnan. An inaccessible high plateau, dissected by deep gorges, dominates the western areas. 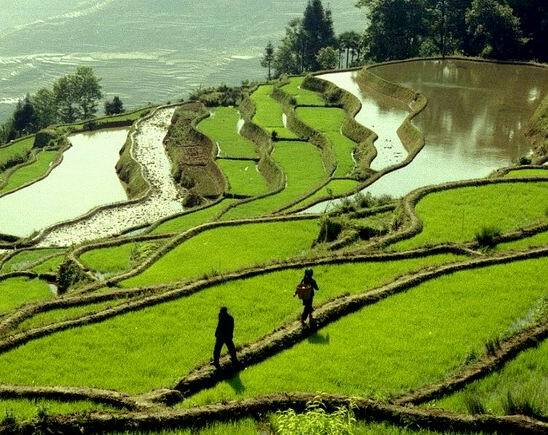 In Yunnan, there is a lot of natural scene. The places of interest here are Dian Spring, Cang Mountain in Dali, Xishuangbanna and so on. Ethnic minorities, includingYi, Miao, Dai, and Tibetans, constitute about a quarter of the total population. The chief crops, restricted to small areas suitable for farming, are rice and corn. Resources include tin ( at Gejiu), copper ( at Dongchuan), iron are ( at Wuding), and coal ( underlying much of the province). And 5 other prefectures: Simao ( with the largest size in land area), Zhaotong, Baoshan, Lijiang and Lincang. There prefectures are sub-divided into 128 countries/districts, including 7 districts attached to Kunming, Qujing, and Yuxi, 12 country-level cities, 29 autonomous countries for ethnic minorities and 80 other countries. The Stone Forest Scenic Area is located in Shilin County, 89 kilometers from Kunming. The area, covering 350 square kilometers, is the highest karst terrain in the world and a national scenic area in China. Western Hill - The forest reserve on the west bank of the Dianchi lake consists of the Huating, Taihan mountains, which extend for more than 40 kilometres.